Bucs defense smelled on more than one down. It has already started. You heard it today from a few people and you will likely hear it more in the coming days. The Bucs defense in the first half was, to use a Dirk Koetter word, horrific. 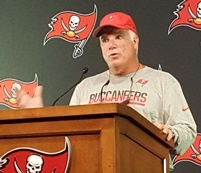 Last week Bucs defensive coordinator Mike Smith vowed he would fix the defense and that the week off for the bye was a big help. Why, during the time the Bucs’ players took a mandated siesta from football, Smith noted that gave him extra hours to study his defense and to find out what is wrong. Smith promised to review every defensive snap of the season to right the wrongs. You will see a difference at Atlanta. Smith must have been watching “Looney Tunes” cartoons instead. Joe spoke with a couple of players after the game and you will read about that tomorrow. They, along with Bucs coach Dirk Koetter, remarked how the biggest problem was that the Bucs couldn’t get off the field in the first half on third downs. While that is not untrue, it’s blown out of proportion. The Bucs couldn’t stop the Dixie Chicks on first down, on second down, you name it. Atlanta had five third-downs in the first half and the Bucs only stopped one to get off the field. You cannot blame the defense stinking out loud on four plays in one half, come on! Once again, the Bucs were unprepared to start a game. The players Joe spoke with claimed the Dixie Chicks did nothing that surprised them. It was just bad defense on third downs. Hey, Joe has to be fair here. Smith had to have made some adjustments as the defense played well in the second half. However, do not underestimate the fact that was while Atlanta receivers Calvin Ridley and Mohamed Sanu were both unavailable. How many more games are we expected to watch the Bucs defense shat all over itself in the first half as if their heads are still in the locker room? As former NFL suit Michael Lombardi said himself, Mike Smith is going to get Dirk Koetter fired. Koetter fired himself when he decided not to fire Mike Smith. We won’t be conned. Dirk “We were done before Halloween” Koetter is responsible for allowing it to happen. Mike Smith is a product of rampant unaccountably put in place by Koetter’s C’est la vie attitude. Meanwhile, the city rages at the ineptness of the “Lost Decade”. Ho hum. Joe this season is over. Smith is ensuring that the entire staff will be fired. I’m actually happy about this. Now if Winston goes, life will be good. No decent QB throws those 2 pics. I’d love to see a good QB with this offense. Just like against the Bears, they didn’t blitz until the 2nd half. Also, why no Vea in the 1st half? Vea didn’t get any real playing time until McCoy went out. All of a sudden linebackers are running free. Is Beau Allen making that much of a difference that it keeps our promising rookie 1st round pick off of the field? Ps: Benenoch is the worst offensive lineman in the league. A blind man could block better than that. He’s lazy and pathetic. There was the 3rd down hands to the face call on McCoy that I actually think was meant to be called on Gholston but was regardless complete BS. That would have taken 7 off the board but whatever. My main complaint with Smith is that coming off a bye, he really seemed to do nothing early on to disrupt the rhythm of Ryan. The Falcons have weapons and you just can’t give him that much time. Fire all the coaches now. Let’s start over now. At first I wanted to blame Licht for drafting MJ Stewart over Donte Jackson who has 3 ints and 3 passes defended in 6 games as a rookie. But then I realized Jackson is a man to man cover-corner and wouldn’t fit in Smith soft zone defense. JPP is out there ballin out of control with 1.5 hands MEANWHILE as predictable as summertime afternoon thunderstorms McIceCream will be missing the rest of the season with an ingrown toenail. At least VV showed up late in the game and stuffed the run gaps on 3rd&short with only minutes left to give the offense a chance. With McIceCream in there the falcons would have surely picked up the first down and run out the clock. Joe, who are you looking at for the next coach? Please no homers. Let’s only look at legit coaches that can turn this train wreck around. Since 1940 and entering today’s games, teams with 100+ rushing yards, 395+ pass yards, 4+ pass TDs were 51-1-1 all-time. Bucs lost with those stats today in 34-29 loss to Falcons. Let’s all sip to Mike Smith & his great scheme! The defense is making progress. The communication issues were fixed, now we just have to work on getting off the field on third down. Mike Smith just needs time. If Smith had any pride or concern for the team or fans, he’d cut a deal with Licht and the Glazers, and just resign. No one can tell me the defense would get worse. Do we want to keep the worst defense in the league. Not me. Does the whole town have to boycott all things Bucs before management decides to relieve Mike Smith of any coaching related duties. Ryan completed over 75% of his passes on the afternoon, and he eclipsed 350 passing yards! Here we go again it’s august and are season is already over. I have never seen a team so unprepared. We had two weeks to get this right and they still came out and did whatever they wanted to against us. ^ Uh, it’s October, and it’s “our” season. ^^^ forgive Jeff the game had him so upset he started doing some Yeager shots. Yes, and even though ATL defense is just as pathetic as ours, Jameis did not keep up with Ryan. As a matter of fact, he threw 2 interceptions in the red zone. Do you like those stats? C.Alaka, can you link to that stat you posted at 6:24? I’d love to see that. It was intercepted on the 1…..but we weren’t in the red zone. Nevertheless….he threw two picks and we had none…..I believe we have just one interception in our 5 games thus far……that’s pathetic. Our DBs are so far away from their receivers, they can’t even interfere. WHY DOES MIKE SMITH STILL HAVE A JOB?!?!! Glazers if you read this blog, please listen to what the fans are saying. You have lost us, we are not going to put up with this pathetic excuse for coaching anymore. It can’t get any worse by firing Smith tomorrow. So what you really want is Jameis to throw for 5 or 6 TDs for us to win all the time. THAT’S THE PROBLEM! Your QB shouldn’t have to play perfect all the time to win. His stats & the way he overall played should’ve been enough to win. Falcons went 3-for-3 in red zone, and Bucs opponents are 11-for-11 in red zone in last four games. NFL-worst 15-for-16 on the season. Our secondary was lost!!! Lack of communication?? Where the F is the DC to solve these rookie issues???? NO WHERE!! FIRE MIKE SMITH AND KOETTER TOMORROW!!!! I’d rather go the rest of the season without them!!!!! What do you expect when you hire the Falcons discarded coaching staff? If these clowns weren’t deemed good enough to win in ATL, in our division, why do we have them? Too little, too late. That defense is down right disgusting. Mike Smith will cost Kwon a huge pay day. He’ll definitely get Koetter fired. He’ll kill the morale of every single player on that team. He’ll stunt the growth of the rookies. Time to get rid of Mike Smith and maybe Jon Hoke and start with a new perspective. Rally this team that can still compete offensively. But, Koetter has to grow a pair. Or everyone should be fired worse than Dungy and Gruden were – midway through Thanksgiving dinner. Kwon Alexander plays MLB like a chicken with his head cut off…although with passion. I fear the complete fail of this defense will begin to creep to the offensive side of the ball. How pathetic was it to watch the defense high-fiving it on the sidelines after a 3rd down stop? Pretty soon Buckner is going to go off on MSmith. He’s not use to coaching a passive defense. He got in JPPs face to correct him right away. This defense needs to do their job n quit playing out of position. It takes a real coach to tell them that.